Paul’s Produce is rockin’. There are routines. The field crew addresses cultivating, picking and packing. My schedule involves sales calls, pick lists, preparing the CSA newsletter and restaurant availability sheet, farmers’ markets, preparing invoices and banking. Paul’s days are the most varied. He does most of the seeding, directs the crew, does all of the irrigation, maintains the trucks, tractors and many other tools, orders seed, boxes and such a variety of miscellaneous items I can’t list them. And after dinner he tends to peruse Craig’s List for “things that could be useful”. One such item that turned up last week was this rock sifter. It needs some tweaking, but we have a lot of rock in much of the ground we are farming. It is set up to sift the rocks from our compost. 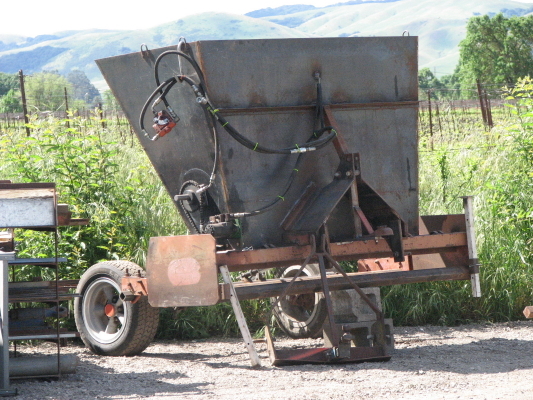 The spreader that Paul made this spring has trouble handling wet compost and compost with rocks. 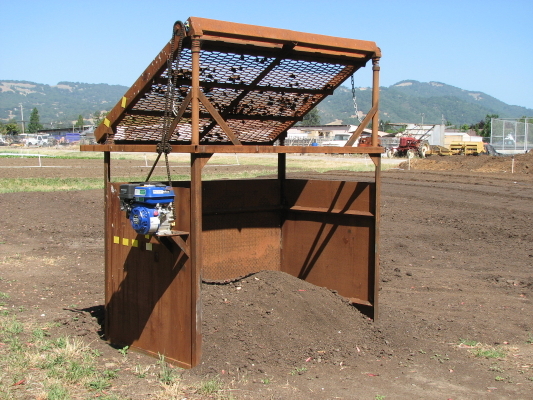 Given the right conditions, this one-bed compost spreader works beautifully. This entry was posted on Sunday, June 26th, 2011 at 2:00 pm	and tagged with artichoke, compost, Crops, farming, lettuce, raspberries, Tools and posted in Uncategorized. You can follow any responses to this entry through the RSS 2.0 feed.